Synopsis: Before Stephanie can even step foot off Flight 127 from Hawaii to Newark, she’s knee deep in trouble. Her dream vacation turned into a nightmare, she’s flying back to New Jersey solo, and someone who sounds like Sasquatch is snoring in row 22. Worse still, her seatmate never returned to the plane after the L.A. layover. Now he’s dead, in a garbage can, waiting for curbside pickup. His killer could be anyone. The FBI, the fake FBI, and guns-for-hire are all looking for a photograph the dead man was supposed to be carrying. I was so hopeful that this would be the last Plum book. I keep telling myself that I should have stopped reading three or four books ago, but I just can’t. Part of it is loyalty/obligation - I loved the earlier books, and I’m attached to the characters - but an even bigger part of it is wanting to know who Stephanie finally ends up with. Maybe not the most sensible reason to keep reading the series, but there you have it. A lot of my complaints about this book are the same as my review of Smokin’ Seventeen. Same jokes, same format, same crazy stunts. However, I think that Explosive Eighteen might have been a tad more original than the past few books. There were a few new jokes, and a few different twists. I laughed out loud a lot, but then I’m really easily amused, and I always find Evanovich funny - Stephanie, Lula, and Grandma Mazur especially are just classic characters, no matter how many times their jokes are recycled. I got the impression that Evanovich might have been trying to mix it up a little, and I appreciated the effort. I still think it’s time to say goodbye, though. Enough is enough. If my library didn’t have these books, I certainly wouldn’t buy them. How many times can Stephanie find herself in life-threatening situations? How many diets can Lula go on? How many funerals can Grandma go to? How many cars can be switched or blown up? The plot is always decent, but there’s absolutely no character development, and despite the fact that I’m hanging on to see the outcome of the Morelli/Ranger love triangle, the romance is lacking. I don’t think most guys would let a girl string them along for that long, or be okay with her sleeping with two guys. If you’re one of the many people who has pretty much given up on the series and you’re wondering whether to read this one, I’d say pass. If you haven’t read the series, I really would recommend starting from the beginning and reading the first dozen or so. They’re hilarious and whacky. Have you read the Stephanie Plum books? What do you think? Did you used to read them but gave up? Have you seen the movie based on the first Plum book, One For The Money? 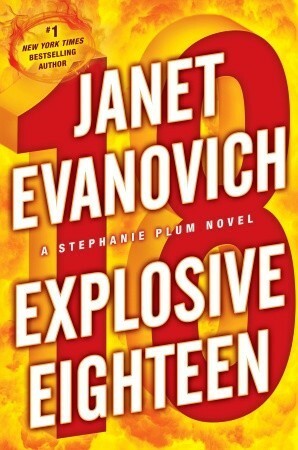 Explosive Eighteen was better than the last few books but it was still not up to the standards set by the first few. There were one or two laugh out loud moments, you find out what happened in Hawaii (one paragraph), & Stephanie deals with some not-so-scary bad guys. I understand that the series revolves around the love triangle, but I wish that something big would shake things up (not a pregnancy like some people suggest). There isn't much spark between Stephanie and Joe or Ranger.